If you haven’t met Flavia de Luce yet, you should. This scientifically precocious English twelve-year-old has narrated seven novels so far, and nothing makes her day like the discovery of a dead body or three. Like a 1950s Sherlock Holmes, to whom Flavia refers from time to time, she uses her self-taught mastery of organic chemistry to solve the crimes–facing, of course, much more official skepticism, because she’s a child, and female. But good children’s literature is nothing if not subversive, and Flavia is that, in spades. 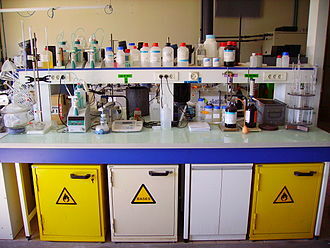 Bench in a chemistry lab (Courtesy Wikimedia Commons). Like Holmes again, her social abilities seldom extend beyond posing behind whatever mask suits her purpose to extract information. It’s more age-appropriate to be socially inept at twelve, so she’s got an advantage over fiction’s great misanthrope. Yet her tastes and impulses are an eccentric mix of beyond her years and not quite up to them, which makes for poignant, painful reading. The only friends she has are her two older sisters, who bully her but occasionally drop a crumb of warmth–almost. She craves being the center of attention, yet loathes it too. Adult readers will cringe at how she’s an unwitting accomplice in her own loneliness–at least, this adult reader does–but she’s terrific company nonetheless, an astute observer and a great wit. In As Chimney Sweepers Come to Dust, Flavia has been packed off (or banished, as she has it) from her ancestral home to Miss Bodycote’s Female Academy in Canada. But she’s not there long before a corpse falls out of the chimney–in her room, no less, wearing a curious sort of medallion. Solving this mystery will take more skills than usual, because she’s without the chemistry lab she had back home and must obey school rules, which severely restrict such things as comings and goings, and what times of day or night are fit for them. Complicating the problem are myriad disappearances and possible reappearances, and the even greater difficulty of telling friend from foe. You see, Miss Bodycote’s seems to be a training ground for girls of special abilities, but what they’re being trained for, or by whom, is an even greater mystery. But really, all you need to know is that Flavia can disprove the legend that the dying Horatio Nelson’s last words were, “Kiss me, Hardy,” because a de Luce ancestor tended the fallen admiral at Trafalgar. Or that if Flavia could raise the arterial blood pH of a particularly odious adult to 7.65, by a particularly sneaky means, “he wouldn’t stand the chance of a snowman in Hades.” Or that the command, “Just look at you!” is “often given to girls my age with little thought given to how difficult it is to carry out.” All that’s in just the first chapter. As you may have gathered, you need not expect an entirely plausible tale here. You will get a tense, well-plotted mystery, however, and startling social commentary from the mouth of a twelve-year-old. Sharp as both my children were at that age, I’m both glad and sorry that Flavia wasn’t one of them.